Our Abpromise guarantee covers the use of ab30351 in the following tested applications. (or 100µl of whole blood). Publishing research using ab30351? Please let us know so that we can cite the reference in this datasheet. This customer has purchased ab30351, because of this customer lost the datasheet of this antibody and this antibody also no longer included in our product range, therefore, Could you please offer the datasheet for this customer? Please find attached the datasheet for ab30351. I hope this is helpful and wish a good weekend. Could you please send me the concentration (mg/ml) of ab30351 - if possible? The information of 50 tests and 10 µl per 106 cells is not enough for the lab. We need the IgG concentration for the control. Thank you for your enquiry. 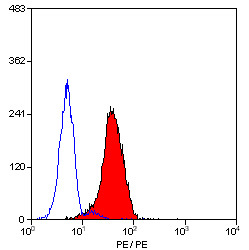 The approximate concentration of this antibody is 0.1 mg/ml. I hope this information helps, please do not hesitate to contact us if you need any more advice or information.